The Toddler 1 students enjoyed a new Language material, with which they match classmates' names to their corresponding pictures. This is a fun way for the students to learn to recognize their own names as well as those of their classmates. 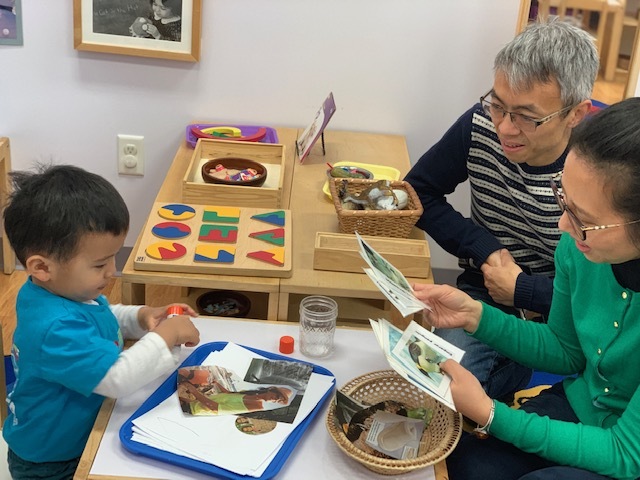 Many of the Toddlers have begun to do this already, by identifying their friends' names on cubbies and shoe baskets, and this work builds upon their existing interest and knowledge. By color coordinating names and pictures, it also allows students to be more successful when matching. Number Bingo is an exciting new activity in the Toddler 1 classroom. This material is a fun way to reinforce number recognition, as well as provide an opportunity for collaborative play between classmates. It is especially fun for them to proudly exclaim, “Bingo!” when their board is full. Thanks to our Toddler 1 families for joining the children for Bring Your Parents to School Day! It was an absolute pleasure to watch how proud the students are of their classroom and their work. We hope you enjoyed your time in the classroom!